What is navigation in heavy weather ? Navigation in heavy weather is defined as conditions with winds of Beaufort Scale 7 or more and a Significant Wave Height of 4 meters or more. Judgment of navigation in heavy weather : The Master shall obtain forecast for the area. Passage plan shall be checked for estimated time of passing such area. If not on weather routing advice already, in case of severe storm, he may ask for such services through the operator. The officer of the watch (OOW) shall collect necessary weather information and navigational warnings and report same to the Master. During navigation in heavy weather, if there occur any sudden changes in climatic conditions the OOW shall report to the Master immediately. 1. Have you informed C/E (Engine Room), head of departments and crew? 2. Have you confirmed openings such as W/T doors / vents/ ports/ chain pipes/ sounding pipes etc are all closed securely? 3. Have all cargo lashings been checked and tightened? 4. Have you secured derricks, cranes and davits? 5. Have all movable objects everywhere onboard (on deck, in engine room, stores, accommodation, galley etc) been securely fixed? 6. Has ballast been adjusted to reduce free surface effect and are draft, trim, and stability conditions adequate? 7. Have you inspected anchor stowage, lashing and stoppers of anchors and chain? 8. Have brakes of the windlass been extra tightened and mooring wires and ropes been well secured? 9. Are two power units for the steering gear running? 10. Has the vessel's course and speed been adjusted as necessary (on masters orders), in order to minimize adverse effects of heavy weather? 11. Has crew been warned to not go out on weather deck without permission? And is permission granted only after appraising situation, adjusting course (on masters orders) if required? 12. Have safety ropes and hand ropes been arranged where necessary (if required)? 13. Consideration of loading Heavy weather ballast in cargo Tanks? The Master must regulate speed and/or alter course in heavy weather, as required by good seamanship, in order to avoid the possibility of damage to ship and cargo, also to avoid needless expenditure of fuel. Reduction of a few revolutions will make a considerable difference to the motion of the ship, but very little difference in voyage time. When he judges that the vessel will be in heavy weather, the Master shall take necessary countermeasures mentioned in the “Navigation in Heavy Weather Checklist” . 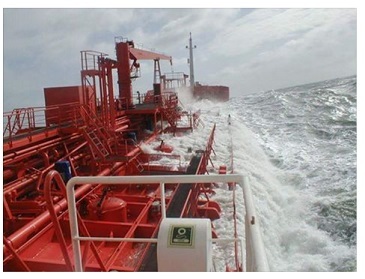 If vessel is available to use a certain cargo tank designated for Heavy Weather Ballasting, and the Master considers it necessary to do so due to inadequate draft, he shall inform it to the company and also he shall take all necessary precautions for this Ballasting and De-ballasting process. The Master shall inspect the vessel and cargo during navigation in (if practicable) and just after heavy weather conditions and advise Company if any damage has occurred. Any possible (even if temporary) repairs by ship staff either to the Hull, Fittings or to the Cargo (Containers) must be attempted by ship staff as soon as weather abates.